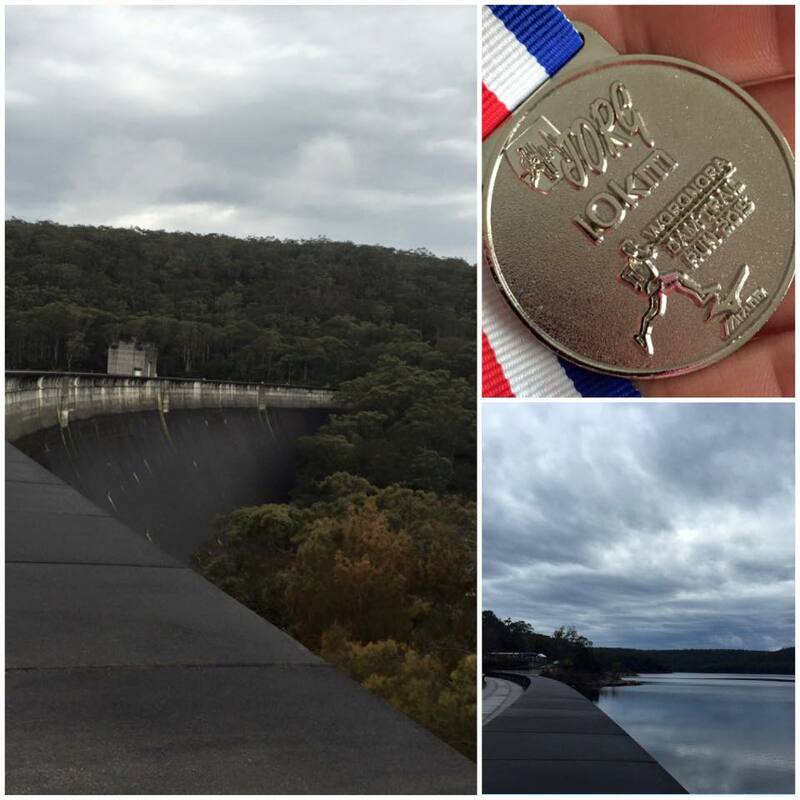 I was having lunch with my friend Amanda a few weeks back and she mentioned the upcoming Woronora Dam run, a local trail run organised by JORG. She was entered in the half marathon and there was also a 10km option that she suggested I should enter too, so I signed up. The weather on the day was not ideal and I was prepared for a muddy trail as it had rained the few days prior and also on the morning of the race, but that never gets me down. I actually like playing in the mud. The course was unknown to me, I hadn’t looked up the elevation chart but I was assured it was one hilly bugger. I chatted to Amanda and some other friends at the race HQ and after hearing more about the course I decided that my goal would be to run the entire trail to use it as hill training, I didn’t set myself and goal time and wanted to just go out and enjoy it. The half marathoners set off first and Amanda looked strong and ready, she was coming back from injury and I hoped she would do well. After a short break it was our turn to start the race, I was nervous but feeling good. The gun went off and we ran up the first hilly road section towards the trail. It was a tough slog at first running up the wet road and having to dodge other runners, and my right knee didn’t like the concrete too much either. Eventually we hit the trail and it got hillier, great (ha ha). This was an out and back course and there were mostly downs on the way out, which meant only one thing….. lots of ups on the way back! So I slowed a little and made sure that I reserved some energy for the way back. There were some nasty steep declines at the moment and I knew it was going to take a lot to run them all on the way back up, it sure would be challenging. It was great to be able to see the front runners smashing it back up the hill as we came down, they looked pretty puffed which only confirmed my fears of how hard it was going to be to run all the way back up! There was a drink station at the turn around point so I grabbed a water and turned to head back up the steep hill we had just come down. This was it, time to hit the run button and just keep running no matter what. I don’t remember looking up much on those hills. I had my head down concentrating on finding a rhythm with my breathing, to keep swinging my arms and lifting my legs. I managed to pass quite a few people as I ran up the hills, most of them were surprised I was able to run them and they encouraged me along. This gave me even more determination to not stop and to finish strong. They were some steep bloody hills! I had my coach Damon’s voice in my head the whole time, pushing me and telling me that it was possible, to just keep running, and that’s exactly what i did. He would have been proud if he saw my run that day. During the last few kms I had the pleasure of running with a young girl called Sian, she was running her first trail 10km and doing really well. We chatted a lot about running and life and it made the time fly past. We were making good speed and I was surprised to note that we might possibly finish in under 60mins, i’d be VERY happy with that considering the hills! We flew down the last hill both pushing ourselves to try and make attainder the hour. We overtook a lady as we neared the finish line and crossed in 58:37 – wow! I hugged Sian and we celebrated our fortunate race result, it was a great way to end a run! After some food & drink I went for a short walk after the run to check out the pipeline and the views, it’s a great spot and i will definitely be back for some training runs. I waited for Amanda to come into the finish line and chatted to the race director Jim as I hadn’t seen him for a while. Eventually Amanda came flying home to finish in under 2 hours, a very great time!! Go Amanda!! It really was a great event and you should all come down and run it with me next year!